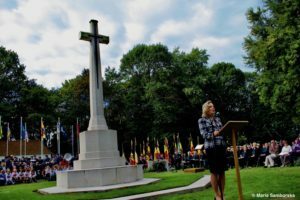 After breakfast, participants made one group with the owners of the Museum and went together to the Maldegem Military Cemetery to take part in the Commemoration Ceremony organized with the presence of the King or his Representative by the Maldegem municipality every year. The Honorary Patron of the Jamboree Minister Anna Maria Anders together with Ambasador Artur Orzechowski and Vice-ambasador Joanna Doberszyc-Toulsaly joined the group. 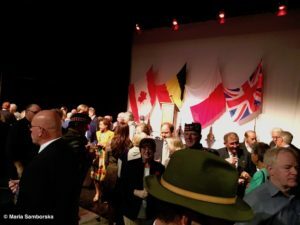 Present were also Polish Army Representatives at NATO, the Council Chairwoman Regina Adamska and Press Officer Janusz Waligóra of Świdnica – the Polish twin-town of Maldegem, representatives of Polish organizations abroad, combatants and schools. 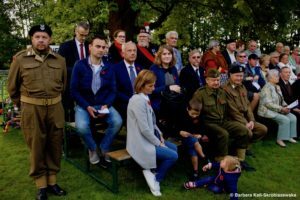 At the Maldegem Military Cemetery gathered a hundreds of people; dozens flags of Belgian ex-combatants organizations and just one flag of Polonia organization – Polonia-Flandria Catholic Association, being hold by Józef Woś. While the national anthems of Canada, United Kingdom, Poland and Belgium were played it happened for the first time that the words of „Mazurek Dąbrowskiego” (Polish anthem) were loudly sung by the Polish participants so they have been clearly heard and noticed with surprise by the rest of the crowd. After the flowers were laid at the monument – Polish wreath by Minister Anders and Ambasador – official speeches have been delivered. The speech of Minister Anders – the daughter of another Polish hero, general Władysław Anders – delivered in English with great expression has brought big applause of the public and the tears in the eyes of Polish listeners. The performances of school pupils followed: among of them was the recitation of Wisława Szymborska’s poem, in Polish and in English. After the imposing ceremony while leaving the Cemetery, General Maczek’s fans promised to themselves to come back next year in the group of hundreds or thousands of their countrymen. The next event was the reception given by the Mayor of Maldegem, Marleen Van den Bussche in the Maldegem City Hall. Among many guests, we met Representatives of other cities liberated by the Maczek’s 1st Polish Armoured Division, such as Teurneuzen (Netherlands) with its mayor Mr. Jan Lonink. 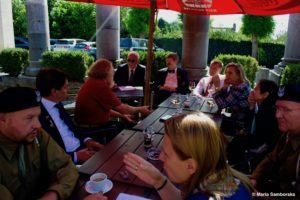 Lunch and the „Round Table” discussion were the last points on the Jamboree programme with the participation of Minister Anders, Ambassador Orzechowski, Vice-Ambassador Doberszyc-Toulsaly and Mr. Arkadiusz Urban, Advisor to Minister Anders. The Ambassador presented the plans of the Polish Embassy for the year 2019, regarding the 75th anniversary of liberating Flanders and 100th anniversary of Polish-Belgian relations. Jerzy Samborski, organizer of the Jamboree and author and leader of the „Liberation Route of 1st Polish Armoured Division of General Maczek” programme unveiled his plans of developing the jamboree project in the next future. He proposed of setting up two committees: Honorary Committee to which he invited Minister Anders as a Chairwoman of Honorary Committee and Ambassador Orzechowski in the function of the Vice Chairman responsible for Belgium’s matters; both invitations were accepted. Similar invitations are to be sent to the Polish Ambassadors in France and Netherlands, as well as to others VIPs. With regards to the Organizing Committee, Jerzy Samborski invited all those attendants of the meeting, who in fact represented „Maczek’s” institutions and organizations, among them Vice-ambassador Doberszyc-Toulsaly, Councillor Urban, Jan Cornellisens (Eerste Poolse Pantserdivisie België), Philippe Verleyen (City of Aalter), Tobiasz Siotor (the great-grandson of Jan Jaworski, Maczek’s soldier), Gilbert van Landschoot (the owner of the Canada-Poland War Museum), Wojciech Romaniak (Reconstruction Group of the Polish 1st Armoured Division „Antwerp”) and Adam Gryczman (General Maczek Motorized Reconstruction Group GRH). Intentionally, the list of the Organising Committee shall be extended with many other members from Poland, France, Belgium, Holland and other countries. At 4 pm, the 1st World General Maczek Fan Jamboree was officially ended.